Acid reflux, or heartburn, is caused by acidic stomach fluids splashing up into your esophagus. Acid reflux can be a symptom of GERD, or gastroesophageal reflux disease. MayoClinic.com advises seeing your doctor if you have heartburn more than twice weekly, if symptoms persist despite self-care, or if you have difficulty swallowing. Seek emergency care if you have severe chest pain, especially if combined with difficulty breathing. Acid reflux is usually treated with medications. Some doctors advocate chewing gum to alleviate acid reflux. Acid reflux results when the lower esophageal sphincter -- the ring of muscle separating your esophagus from your stomach -- loses pressure or weakens. Symptoms of reflux include a burning sensation that radiates from your stomach into your chest and throat, sometimes coupled with a sour taste in the mouth or a sore throat. Health Central states that eating heavy, fatty or acidic meals -- especially before bedtime -- can trigger reflux. MayoClinic.com notes that acid reflux pain is worsened by lying down or bending over. The practice of chewing gum -- or gumlike substances -- dates back to antiquity. The International Chewing Gum Association notes that ancient Greeks chewed lumps of tree resin to clean their teeth and freshen their breath. Native Americans chewed tree sap; later, American settlers combined tree sap with beeswax for a softer chew. 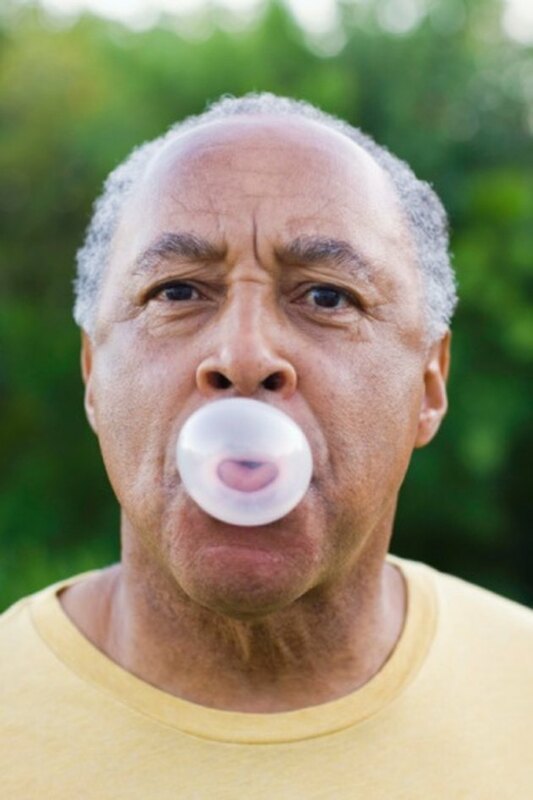 The first commercial chewing gum was patented by a dentist in 1869; in 1906, Frank Henry Fleer debuted the first bubble gum. The website adds that each person in the United States chews approximately 182 sticks of gum -- or the equivalent -- per year. Todd Eisner, M.D, a gastroenterologist in Delray Beach, FL, says that chewing gum increases both production of saliva and frequency of swallowing, helping to rinse away acid that has splashed up onto the esophagus. Eisner endorses the chewing gum remedy particularly for pregnant women, and adds that changing hormonal levels and the developing fetus cause up to 50 percent of pregnant women to suffer from acid reflux. For best results, Eisner advises chewing gum for 30 minutes following a meal. Some scientific research supports the belief in the beneficial effect of chewing gum on acid reflex. In a clinical study conducted by R. Moazzez and colleagues and published in the November, 2005 issue of the Journal of Dental Research, researchers found that subjects who chewed gum for a half hour after eating a meal experienced significantly less acidic esophageal reflux. UC Davis Health Systems advises chewing gum to treat acid reflux, and recommends sugarless bicarbonate gum -- found in the toothpaste aisle of pharmacies -- in particular. The website notes that in a study conducted by B.R. Smoak at Wake Forest University, 40 patients suffering from reflux were given either regular sugarless gum or sugarless bicarbonate gum to chew. Researchers found that while both types of gum increased salivary bicarbonate -- making saliva more alkaline and helping to prevent reflux -- the sugarless bicarbonate gum performed better than the regular sugarless gum. Researchers concluded that chewing gum is a useful adjunctive therapy for treating acid reflux.